Over the last few months, our team realized we needed to refocus the scope of AOTW. We’ve almost completely overhauled much of our original story, but we’re really excited about the new direction that things are going. We also completed an internal demo. And, though most features are still in very developmental stages, we’re finishing and polishing fundamental features bit by bit. Most importantly, we can now share screenshots of our progress! Below are some screenshots from our internal demo. 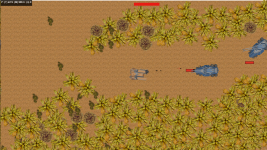 In the shot below, you can see an early version of a player tank (on the left) making its way through a jungle path that is defended by several enemies. 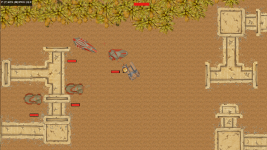 Weapon projectile animations are just placeholders for now, but here the player tank is exchanging fire with the enemies using its secondary weapon (a machine gun). Player tanks will always have both primary and secondary weapon slots. In our second screenshot you can see an early version of our minesweeper in action. Certain enemy types my have the ability to lay mines (represented here by the red cross hairs). 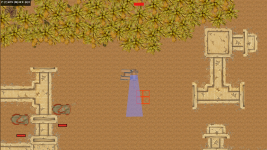 The minesweeper ability on the player tank, if equipped, would enable players to detect mines and pick their way through treacherous mine fields. In our third screenshot below, you see our loyal player tank preparing for an ill-fated assault on the final base section of the internal demo. You've probably noticed the standard health bars under the enemy tanks by now. If you look at the top of the screen, you'll see another (increasingly small) red bar. This is where players will be able to track their health. Eventually, other indicators will be seen at top of screen as well, such as a heat indicator and ammunition indicator. Our long term goal is to create a minimalist HUD where players can keep track of the essentials without having their field of view unduly obscured. Thanks for checking out our first news update with screenshots! There will be plenty to more to come as we add new features and polish our graphics. For more background on Armour on the Wastes and on our team, please check us out at aotwgame.com or follow us @AOTWgame. Thanks for your time -- feedback in the comments section is much appreciated!